In the pages of the Scott Pilgrim graphic novels, Bryan Lee O’Malley used classic video game conventions to explore the turbulence of dating someone carrying emotional baggage from past lovers, and while his new graphic novel, Seconds, is a considerable departure from that concept, it cleverly uses video game elements to delve into personal drama. This is a story about magic mushrooms and extra lives, but it’s far from Super Mario Bros.
Katie is a chef who is unhappy with her current life situation, broken up from her boyfriend of four years and struggling to open a restaurant she can call her own, but when she discovers a crop of reality-altering red mushrooms, she finds that she can rewrite past mistakes to give herself the perfect life. Rather than making explicit video game connections (there’s no need when he uses classic iconography like red mushrooms), O’Malley moves in a more mystical direction with the plot, exploring a different side of his craft. 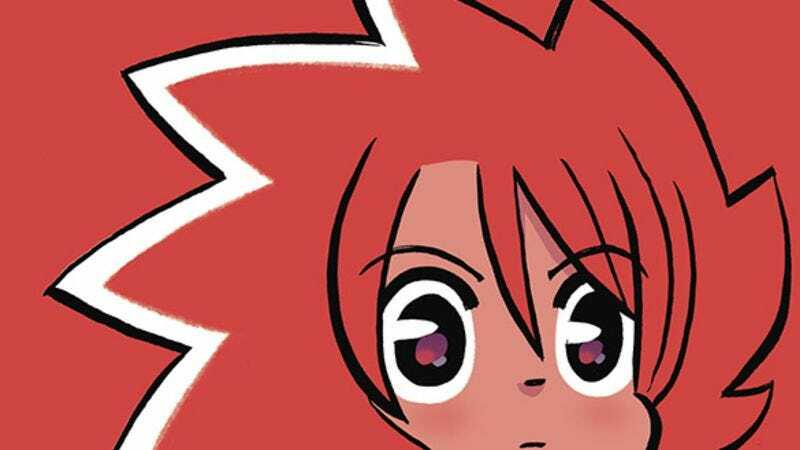 Seconds has all the wit, charm, and spectacle of Scott Pilgrim, but it achieves greater emotional depth thanks to a concept that allows O’Malley to explore character relationships from a variety of different angles. The major themes of Scott Pilgrim are also at play in Seconds—adult stagnation, unresolved issues with exes, the fragility of affection—but they’re approached with more subtlety and grace in this tight, engrossing narrative. Katie is a lovable doofus in the Scott Pilgrim mold, but her problems are considerably more complicated than Scott’s, making the mushrooms’ magical allure even harder to resist. She’s an incredibly skilled chef with a successful restaurant, Seconds, but that just doesn’t fulfill her anymore. Most of the friends that she started the restaurant with have moved on to new endeavors, and she’s starting to feel old as a 29-year-old working with a staff of “stylish, sullen babies.” Katie has started renovations on a space that will ideally be her future restaurant, but the slow crawl of that project damages her resolve and leaves her desperate for an easy way to make everything she wants happen. When Katie discovers a small box hidden in her dresser, she finds herself in possession of a magic mushroom, a notebook titled “My Mistakes,” and a printed instruction card with directions on how to alter reality in her favor. By writing a mistake in the notebook and ingesting a mushroom, Katie is able to undo any past errors as long as the events occurred inside Seconds. She starts with a relatively small revision, but when she discovers a larger stash of mushrooms, she starts making bigger changes in hopes of fixing everything that went wrong in the last four years. Anyone familiar with stories about manipulating the past can guess what happens next, and each new alteration introduces a new set of problems for Katie to deal with, many of which she has no knowledge of because she’s found herself living a completely different life than the one she had pre-mushroom. As Katie revises the past, her personal relationships are impacted in dramatic ways, particularly her romance with Max, her ex-boyfriend. The character interactions are the heart of the book, but the brain is in the spiritual elements of the story, which ask cosmic questions about the idea of home and the perils of playing with the fabric of time and space for personal gain. Two of the major forces in the plot are house spirits that have been affected by Katie’s mushroom adventures, and the addition of these mystical characters opens a pathway to more fantastic story avenues that exponentially expand the scope of narrative. As a visual storyteller, O’Malley has grown dramatically since the last volume of Scott Pilgrim, bringing more detail to his environments while refining his emotional storytelling to make his characters as expressive as possible. With her spiky fireball of hair, Katie’s design radiates energy even when she’s doing nothing, and O’Malley conveys a huge array of feelings by altering the shape of Katie’s huge eyes and the size of the pupils within. Personalities are immediately conveyed in each character’s appearance, and special attention is given to body language to make sure the physicality matches the exaggerated facial expression. The bold characterizations make for a lovable cast, but the most impressive leaps in O’Malley’s art are in his layouts and environmental designs. Seconds’ rustic exterior is a strong contrast to the stately stone structure of Katie’s new restaurant on Lucknow Street, which has a huge open area for cooking and seating while Seconds keeps its cooking staff in a cramped basement. An early two-page splash showing a three-quarters-view cutaway of the Seconds basement is an early indicator of O’Malley’s evolution, and the incredible amount of detail pulls readers into the environment that they’ll be spending the majority of the story in. Published by Ballantine Books, a division of Random House, Seconds is a gorgeous hardcover with exceptional binding and paper quality, the latter of which greatly benefits Nathan Fairbairn’s coloring. Fairbairn is an essential part of the creative team, which also includes Jason Fischer as drawing assistant and Dustin Harbin as letterer, and his palette helps dictate the tone and intensify the atmosphere of each scene. Early on, Fairbairn establishes the color red as a tie to the spirit world, which makes Katie’s red hair an even more important design element, and he contrasts the red with saturated blue to great effect when Katie’s life takes a more magical turn. Katie’s real world is cold and hopeless, but the mushroom creates the possibility for a reality that is hot and thriving, and when Katie makes her revisions, those past events are all depicted through a filter of warm shades of red and orange. Once Katie wakes up in the new reality, that heat dissipates to show that she’s back in the cold, hopeless environment she’s trying to escape. Fairbairn’s work coloring the reprints of Scott Pilgrim has given him outstanding creative chemistry with O’Malley, and his coloring choices amplify the emotional impact of this story while heightening the detail in the linework. The images of Katie’s food wouldn’t be nearly as appetizing without Fairbairn’s coloring, and his work brings a huge amount of flavor to the entire graphic novel. Seconds arrives with high expectations, and it meets them all, delivering the style and humor of O’Malley’s past works with greater emphasis on mood, detail, and complex character relationships. There are still plenty of juvenile impulses at work (including a silly callback to a Scott Pilgrim joke that O’Malley apologizes for on the page), but this graphic novel shows how much the creator has matured without losing sight of the fun and imagination that has made him so popular.